And so you have, dear funny, tender, brilliant, generous in heart and deep in spirit man. You have lent the world a whole new way of seeing, and a belly laugh besides. Your words already changed the world and you have enriched it beyond measure. No matter what your sorrow told you, may you know that your life mattered, and that your ideas made us all richer. 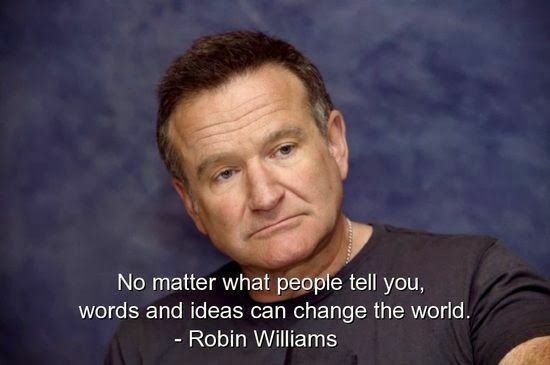 Rest in peace, Robin Williams, comic wizard, angel now. Truer words were never written than these. And to your eloquent elegy I add, Metta, dear Robin. You have taught us much in life and teach us more through death. Thank you. Thank you Sonnische. He has left us all richer. I only wish he hadn’t let quite yet … and that he has suffered less pain in his living.